Easily organize and search for contracts with a central repository from SpringCM. The way contracts and related documents are organized can make or break business productivity. Sales teams must locate contracts quickly in order to respond to customer inquiries or process renewals, and legal teams need visibility into the contractual risk within the organization. Businesses could have thousands of contracts active at a given time, and sales operations teams and contract managers need them organized so they can be searched and reported on in order to quickly respond to the needs of the business. 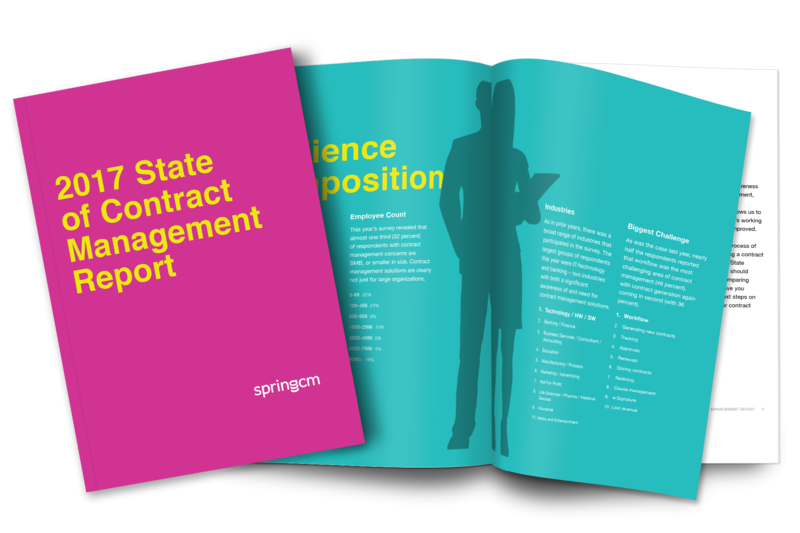 If your contract process is holding up the deal cycle, SpringCM can help. 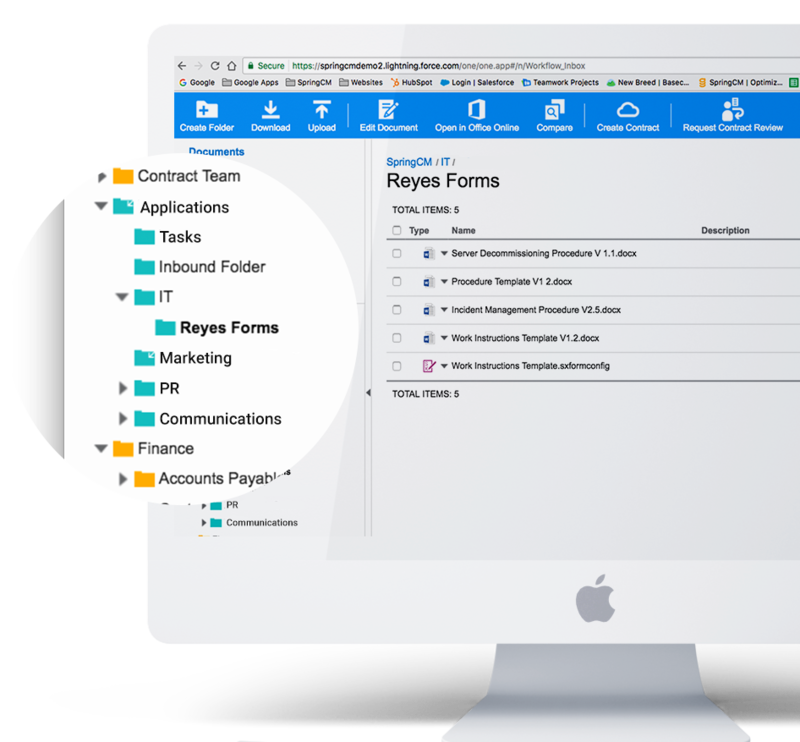 Contract management begins with a flexible, scalable central repository with an intuitive folder structure that accommodates the way your teams work. Whether they work all day in a CRM system like Salesforce, bounce back and forth between the office and home, or need immediate access to a contract from their mobile device, building a central repository allows your teams to securely access contracts from anywhere and quickly get to the contracts they need. With SpringCM, you can find any document within seconds, even if you don’t remember the file name. With SpringCM’s Full-Text OCR-driven Search, users can locate a document based on the text within the body of the document, whether it’s a PDF or Word file. Additionally, teams can decrease the level of effort and time spent reporting by leveraging bulk search across the full contract repository to identify contracts containing a critical term or clause. 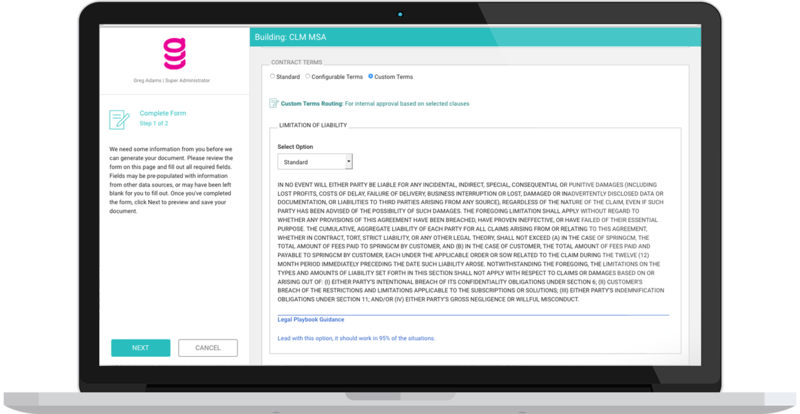 SpringCM’s configurable contract metadata allows contract teams to define critical terms that are relevant to their business. SpringCM’s tagging and metadata capabilities allows teams to leverage powerful tools to search for contracts that contain specific contractual terms such as limitation of liability and indemnification, or renewal terms such as renewal notification window and termination notice window. Our contract repository comes with federal-grade security that ensures your content is kept safe and secure. In addition to state of the art architectural security, our application security is easy and intuitive to set up, allowing administrators to enforce rules-based contract access based on line of business, user role, and organizational responsibility - ensuring that only the right people within the organization access critical contracts. And we’ve seen it all: including rooms full of file cabinets, contracts scattered across shared drives, desktops and email. 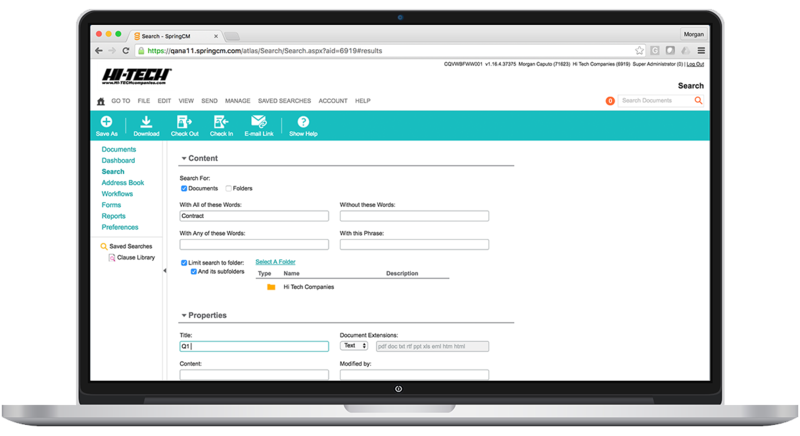 SpringCM isn’t just a new way to organize contracts moving forward, we’ll help you get started by moving all of your current contracts (paper or digital) into a central repository. No matter the state of your organization’s contracts, we will get you up and running with our ingestion and indexing services, paper scanning and conversion, bulk uploads and more. Fill out the form below for a free demo of how great your contracts process could be.